Utopia’s Master Data Governance (MDG) Rapid Deployment Package (RDP) is a fast and simple way to deploy a baseline Data Governance solution in just weeks. The Utopia RDP delivers a fast track approach to adopt SAP Master Data Governance across multiple Lines of Business. It also provides end-to-end master data CRUD (create, read, update and delete) processes throughout the enterprise landscape and helps overcome data quality and data remediation challenges. This is a critical step along the journey from knowing if your data is clean, getting your data clean, and keeping your data clean. It is an element of Utopia’s “build, fix, sustain” data methodology model. It creates a foundational stepping stone upon which to build a more mature, comprehensive master data governance solution. The basic RDP is six weeks for simple master data objects, and can range up to 12 weeks for the more complex objects. From here, additional business rules, work flow stages, user roles, and other value-creating options can be added to expand the holistic solution and optimize the return on information. 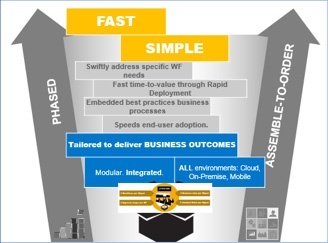 The illustration below shows a typical, rapid six-week project plan based on the SAP Activate methodology.